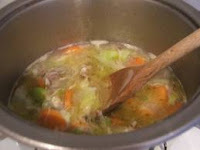 Place all ingredients in a stockpot, bring to a boil, reduce heat to medium and cook uncovered 45 minutes. Let broth cool for 1 – 2 hours before straining. Broth can be divided and frozen for up to 6 months for future use. You can add various vegetables, herbs and spices to your broths. Just be aware that a basic broth is more versatile than one that is loaded with flavor. Put the dry herbs and seasonings in at the beginning of the cooking process and the fresh in towards the middle to end. Use both fresh and dry of the same seasonings i.e. onion powder and diced onions, garlic powder and garlic cloves, etc. If using fresh leaf herbs like parsley, basil and cilantro, etc add them at the end of the cooking period. You get the full flavor of the herbs when the heat carryover from the cooking process cooks them. Use vegetable broth (homemade) as the base of all your soups; it cuts down the sodium, fats and calories, just to name a few. If you don’t have any vegetable broth on hand, just add 2 – 3 large bay leaves to your water and build the flavor from there like we did with the split pea soup.